Looking for the most trusted name in a Columbus, Ohio furniture store isn’t really much of a challenge. The truth is for locals and visitors alike Amish Originals Furniture Co. has everything you need in a furniture store. We’ve earned our outstanding reputation by being the best there is, plain and simple. 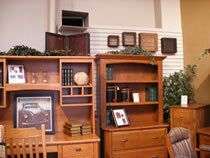 We have all of that and more, which is why we have become the choice Columbus, Ohio furniture store. One of the best reasons to shop at Amish Originals Furniture Co. is that we truly are original. How many other furniture stores can you shop at and have your selected pieces custom made? When you come into our showroom or begin browsing online, you will be able to take a look at all that we have to offer. From there you get to customize your pieces, based on details including wood choices and finishes. We work closely with more than 70 families in the nearby Amish communities to begin the process of having your pieces custom made. The end result is stunning, hand built pieces meant to withstand the test of time. That means you aren’t just buying furniture, you’re investing in pieces that are sure to become family heirlooms for generations to come. What’s So Special about Our Furniture? If you haven’t ever seen the process firsthand, it can be hard to truly understand what goes into it. Having your furniture hand built by members of the Amish community is like nothing else available today. In fact, sometimes you may have members from three different generations of the same family working together on your pieces. These time honored traditions get handed down as they are taught to the next generation of furniture builders. It means that every detail, down to the intricate dovetailing process, is done by hand. We’re proud to be a Columbus, Ohio furniture store option that can make that claim. And yes, we even have some of the most stunning options for outdoor furniture for you to choose from. So when it comes to deciding which Columbus, Ohio furniture store option is right for you, the choice should be obvious. The bottom line is that this is about furnishing your home. Don’t settle for less than the best when it comes to choosing your furniture store.